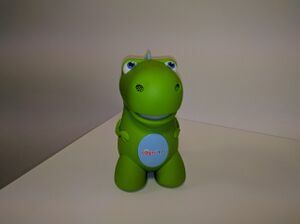 CogniToys is a Wifi based smart toy Dinosaurs which can learn from people, especially children. The technology behind the CogniToys is IBM Watson and Elemental Path's Friendgine. Power up the Dino and start talking to it by press and hold the big button. To learn howto work with this product you can visit an tutorial or course site. This page was last edited on 2 June 2016, at 13:26.